Use this document template to buy a single company that has no subsidiaries. The deal gives extra protection to the buyer: part of the payment for the shares is withheld and will be paid later, conditional on profit targets being met. The document provides the option for the final price to be increased if the first year profit target is met. It also provides extra warranties related to real property. 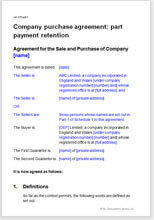 This document is for selling or buying a single company of any size. It is suitable for low or high value transactions and for absolutely any sort of business. Although this agreement is drawn for a buyer to use, it can be a valuable tool to either side of the transaction to give an understanding of what should be covered and what possibilities there are for negotiation. Warranties protect the interest of the buyer, who does not have all of the information available to the seller. It is fair and reasonable for a buyer to demand warranties and for a seller to give them. However, it is quite easy for a buyer to use warranties to improve his original deal. So, if you are a seller do not give a warranty if you do not know whether or not it is true, but be prepared to go and find out information that could be within your knowledge. 110 warranties sounds too many. You may not need all of them, but you should consider each one. Our warranties are written in plain English. A seller should start with a full set unless he is sure he knows everything there is to know about his proposed acquisition, or the value is very small, or the company is not trading. As buying the company entitles the seller to receive shares as part payment, immediately on completion of the deal, the seller should enter into a shareholders' agreement with the existing shareholders of the buyer.